Ornamental alliums are one of the easiest, most striking and cost-effective fall-planted but spring-flowering bulbs that you can grow. They are easy because deer and other critters don’t eat them, they grow in any well-drained soil, are drought-tolerant and while they prefer full sun, they will stand a little shade. Alliums come in hundreds of varieties – tall, short, with huge flowers (almost a foot across) and with smaller flowers. The bulbs should be planted the same time as daffodils and tulips; October or November is ideal, but they can go in anytime before the ground freezes. They come in many different shades of purple and also in white. Visit your local garden center and pick the ones that strike your fancy. One of the most popular is Purple Sensation. In late May or early June it produces bright 4- to 5-inch diameter purple blossoms on sturdy 24- to 30-inch stems, and the blossoms last for several weeks. 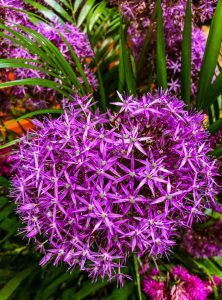 For a contrast, try Allium karataviense, a low-growing heirloom introduced in 1876 that has white 5-inch globes with just a hint of purple, and ribbed foliage. And then wait for the spring show.